Captain Black Pipe Tobacco is the most well-known smoking brands in the world. Created from Virginia and Cavendish tobacco leaves, this aromatic tobacco blend has a mellow flavor intensity that yields a medium to mild smoke, eliminating all the harshness that comes with many full bodied pipe tobaccos. 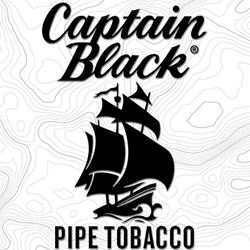 From novice to the most experienced smoker, Captain Black Pipe Tobacco is the perfect choice. Try out this legendary pipe tobacco brand at a discount online price today! Captain Black Pipe Tobacco is distributed nationwide by Scandinavian Tobacco Group, Copenhagen, Denmark. Captain Black Pipe Tobacco is available at our online tobacco store offering unique styles to choose from. Currently available in Gold, Original, and Royal Blue. At Smokers Discounts, our motto has always been, sit back, relax and enjoy a great quality smoke at an inexpensive price. Captain Black Pipe Tobacco offers an excellent choice for your pipe smoking needs. Our online tobacco store was built specifically to help make it easy and affordable to buy pipe tobacco online. Call us for more details!